TTouch-what is all the hype about this modality about? TTouch – what is all the hype about this modality about? Ever since I started working with this amazing modality so many years ago, there is seldom a day that goes by that I do not mention it, use it, or rave about it, and I am definitely not alone in my feelings about TTouch. There are thousands of people throughout the world that are equally in awe of the changes that can come about when using TTouch on either an animal or a person – both physically and from the behaviour viewpoint. In all honestly, we really do not know why TTouch makes the differences that it does, although a lot more work on the scientific side is now being researched. We do know it elects changes in brain wave patterns, affects the Central Nervous System, which is the home of the autonomic flight, and fight patterns, and brings about changes at a cellular level. It also builds trust and increases the bond between pet and owner, but honestly, the majority of pet owners don’t really care about the details – they just want to know if it works – and it does! My own introduction to TTouch was to help my Rotti, Zeus with an inoperable spur on his spine. I was one of those sceptics that was not sure if it would help and I was sure his behaviour would not be affected – I mean how could some Ttouches and Groundwork affect the way he behaved? I had been told I was lucky if he had another 6 months before I had to make ‘the decision’ and TTouch was really my last chance of helping my dog – nothing else was working. Well, needless to say, Zeus went on happily for a number of years and I started noticing changes in his behaviour. He had previously been very reactive, and he started to ignore and not react towards other dogs, overall, he was so much more relaxed– I was hooked – the TTouch bug had struck me big time! I have worked with hundreds of clients over the years, ranging from those owners that want to try a more natural approach to help their dogs, right through to total sceptics like myself who are desperate for help and will now try anything – and the end result is always the same – changes take place and the dogs behaviour or physical condition will change for the better – and nobody really knows why! Is TTouch the ‘miracle cure’ that so many people claim it to be? No, it is not – it cannot change physical conditions such as HD, arthritis, cancer etc, but what it can do, is to take pressure off affected area and provide relief for other parts of the body that are being overused due to the animals physical challenges and brings a degree of relaxation which helps the animal to cope. This alone will help the pet to cope more with its existing condition. However, I have seen umpteen conditions in dogs that were considered ‘past hope’ where the use of TTouch has made such a difference to the animal. Some of these instances are dogs that have suffered spinal strokes and are paralysed, where some amount of usage of the limbs has occurred after TTouch. A dog I am currently working on that had distemper as a pup and its hindquarters would flop over or collapse continually, is definitely showing improvement. This dog’s back is still very roached and will probably remain so, but this same dog is now able to walk in a straight line without its hindquarters collapsing continually and they only go haywire now when it runs. How did this happen – I don’t know, but it did, the TTouch magic was at work. Let’s talk about dogs with fear issues, especially those in rescue shelters. The differences I have seen using a combination of Calming Signals, approaching the dog in a manner it can understand and cope with, and then doing Ttouch, are often beyond belief! I have worked with feral cats and dogs in these circumstances, and each and every time TTouch has worked its magic and the animal has learnt to trust and major changes take place. Linda Tellington-Jones, the founder of TTouch, always says that this is the Touch that both Teaches and builds Trust, and she is so correct. Think about a dog that hates its nails being trimmed for a moment – possibly 5-10 minutes of TTouch later, with a little of desensitizing to the clippers being done, and you have a dog that no longer has a problem. As I work as a canine behaviourist I use a combination of behaviour modification as well as TTouch and the changes that I see occurring daily amaze me. Nowadays, I never leave a client unless I have given them the two basic TTouches of Noah’s March and Ear work, and have done a little basic work on the dog myself, and just this alone can start to make a difference. In behaviour, we often refer to an extinction burst occurring. This is where the behaviour will improve, then suddenly, for a day or two, the behaviour will go back to the original unacceptable behaviour (sometimes worse), before it starts to improve again. With TTouch brought into the modifications, I very rarely ever see extinction burst occurring, and in the odd case it does, it is very mild. There are no words that can describe the changes in a dog that has been fearful, been in pain, over the top, reactive etc, when at the end of a TTouch session, it breathes a large sigh, the whole body relaxes, and it is as if all the stress has left the body, or a huge burden been removed - I really am in awe of what I see happening daily. An additional bonus with TTouch is that unlike massage, a little daily, or a few times a week can bring about amazing changes as this modality is accumulative. My own belief is that each and every pet owner should learn at least the basics of this amazing modality – it really does make such a difference. 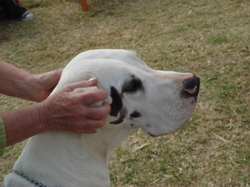 For more info on TTouch you can either contact me at scotty@scottysdogs.co.za or have a look on the TTouch website www.ttouch.co.za, for a practitioner near you or a workshop being held – you will never regret it!